Home » Have a new crazy haircut? Daily Mugshoot it! Daily Mugshot iPhone App Review. Now your crazy look won't go unnoticed anymore as long as you take the time to document it. 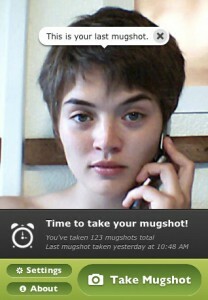 Snap out that iPhone and take a picture of yourself and post it online via Daily Mugshot. Daily Mugshot is a popular web tool that lets you post pictures of yourselves, labeled daily mugshots, thus letting your friends, and yourself, keep track of you and you daily evolution. This iPhone app acts as a complementary to the complete web service you get when you sign up with DailyMugshot.com. With your free account on the website, you can take a daily photo of yourself by using your webcam directly on the website, or upload it from your PC, and then share the results with your friends. You can also add all your daily mugshots into a virtual flipbook to share and enjoy. 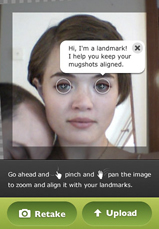 Flipbooks and mugshots are easily shared via freely available widgets you can place on your web profile or blog and that automatically update as you take a new mugshot every day. With Daily Mugshot for the iPhone, you can take your pic on the go and upload it online. Once you start up the app, simply log in (or head over to create an account) and you're all set for picture time. You will notice the big button "Take a Mugshot" and that is essentially the only feature you will need with this iPhone app. Take the mugshot and, just as you would use the panning buttons regularly with your iPhone camera, pan, zoom and rotate to get the desired focus and effect with your mugshot. Hit the upload button and the app will take care of the rest. Your daily mugshot will be available online and your account profile will be updated. The process takes a few seconds of your time and will give you hours of fun and laughter when you review how your looks have evolved over time. In case you forget to take your daily pic, the site also allows its users to set a reminder to get you back on track. The iPhone app is available for free to download in the App Store. What do you think of Daily Mugshot ? Scroll down for our comment section and let us know! I can't find this in the App Store anymore. Was it pulled from the shelves?